Many of you know my background, but for those who may not, for 20 years I was a Human Resource Manager in a range of different public and private sector companies. One of my niche areas of expertise was performance management. In that time I assisted to create and then train all Queensland Public Service employees in the then new Performance Management standards as part of a central agency. I then implemented and improved performance management systems in a number of agencies as well as private sector workplaces. How I would do that was work with each company to create the system that was right for them and their culture – train managers and their team members on performance reviews, and then sit with each manager as their personal coach during their first round of reviews. That means I have been part of literally many hundreds of reviews over the years and have trained a few thousand people. Why am I telling you this? Well, you could say I have pretty much seen it all when it comes to managing performance for employees. I have seen the full range of managers – from hands-on in the trenches managers to ones I swear tried to manage by telepathy as they were so remote. I have seen managers who saw performance management as something that someone else does on their behalf, some who believe all performance is purely a result of logic and facts and others who were so enmeshed in their teams it is hard to work out where one starts and the other stops. The biggest thing I have seen is that no manager automatically jumps up and down the first time they are to do their first performance review and says “Hurray – it’s performance management time, let’s get into it”. Generally, the first thing that happens is Managers nod politely through the training, walk knowingly through the forms and then … not much happens. “Yeah, I’ve been meaning to do it, but I am just not sure how to do step 7 exactly“. When talked through step 7, then all of a sudden it is step 4 and then step 3 that’s the problem area they need clarifying. Or, “Look I am just so busy, you know how it is. I will get to it when I get a bit of a break in the deadlines“. Which is never. Or, “I give my team feedback all the time. They know exactly where they stand“. Yet when you ask the team you get responses from, “in his dreams” through to, “yes, he does give regular comments, but I would really like to have a one on one longer chat with him about how I can grow“. Or, “I’m just waiting on my boss to do mine. When that happens then I will do my teams“. Which turns into – look the boss has taken too long, so we had better wait for the new strategic plan to come out first (and so on). To be blunt – these are all just excuses, and they are not the real reasons for avoiding reviews. If I kept on digging and digging and digging, what I would eventually come to is the real reason people don’t do performance management – fear. People procrastinate about what they are most afraid of. That is the real reason – they were afraid! What are some of the real fears about performance management? That someone may cry or get angry; that someone may disagree and take a case against the manager; that the manager won’t do it “right” somehow; that they give a great review and their favourite employee decides to go for a promotion somewhere else; or that the manager works hard to give a balanced review and nothing changes in terms of behaviour. There is also the fear of receiving feedback. This is a BIG one – many managers hate to receive feedback or performance reviews for themselves as a manager, so don’t want to give feedback. The extent of their personal fear of receiving feedback is at the extent same level they will block doing reviews for others. What I found was once the manager acknowledged their personal fear, only then were they really ready to do performance reviews. It was always like a work out in the gym – they may not have looked forward to it, but they feel great at the end of it. So what has this to do with responsibility? Every employee deserves your time, where you sit with them and take them through what they do and don’t do well, and how to develop the skills that may be a bit lacking. 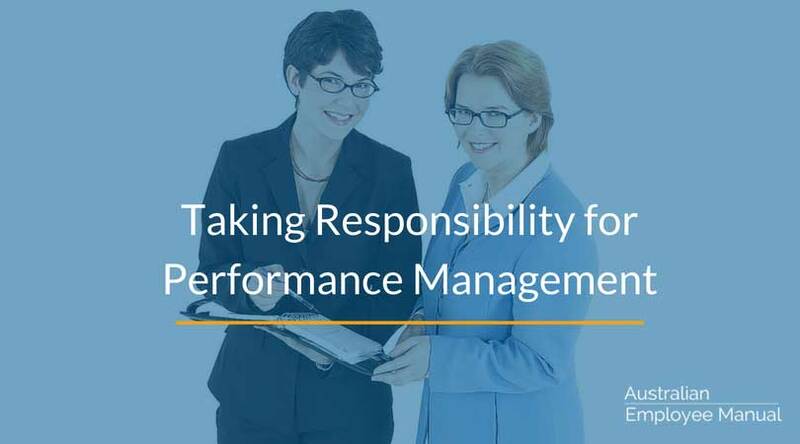 To do this, you need to take responsibility as a manager for actually taking the time to manage the individual’s performance. You need to regularly stop, remove the distractions of the phone and computer and give your employee your undivided attention. Undivided attention and listening are some of the deepest and most profound things you can share with someone. By giving someone that gift, you are saying they are a worthwhile human being even if they have the odd piece of challenging behaviour. You validate them as a person, and you build trust with them as a result. In order to allow you to do this, you need to take responsibility for your own fears about reviews and communication, name them and deal with them. Performance management is a very powerful tool to build trust, productivity and deepen relationships in a workplace. You just need to take responsibility and step up to the plate. Need more training in effective performance reviews? 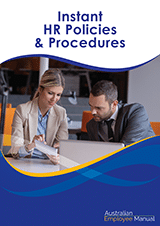 Our Employee Performance Review pack includes a series of training recordings.